Retired By King & Country April 2019! Order Now Availability Very Limited! 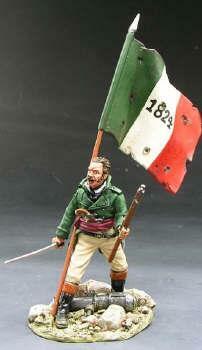 Bonham stands defiantly, sword in one hand, rifle in the other supporting the 1824 Republic of Texas Flag. Scale 1:32 / 54mm, made in Pewter with a matt finish.